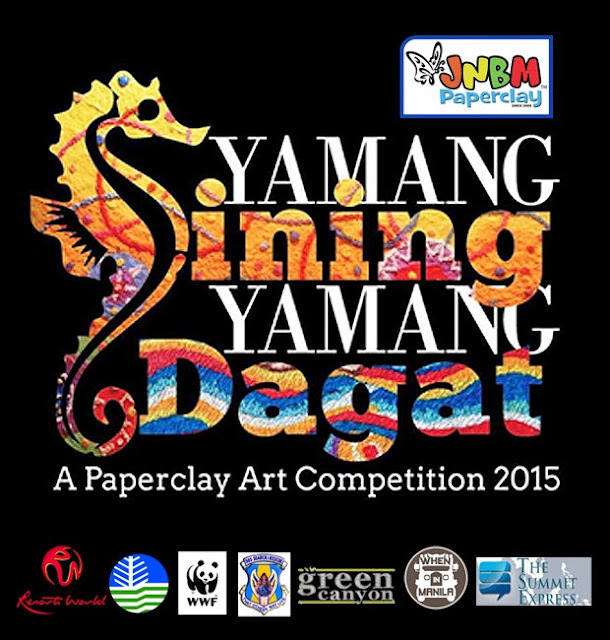 Join National Paperclay Art Competition 2015: "Yamang Sining, Yamang Dagat"
MANILA, Philippines - The country's very first patented Paperclay Company, the JNBM Paperclay officially launched on Friday, May 15, its national art competition entitled “Yamang Sining, Yamang Dagat” as part of their 10th anniversary celebration. According to JNBM Paperclay, the main objective of this competition is to promote awareness for the care and preservation of marine wildlife. In addition, it introduces paperclay as a universal art medium that would serve as inspiration for a new batch of Paperclay artists and would create world-class paperclay art pieces. Registration starts today, May 15, 2015 through JNBM Branches or online registration. The competition proper is scheduled on May 15 – June 30, 2015. The board of judges includes Filipino artists Raul Isidro, Nemi Miranda and Egay Fernandez, Adamson Art Museum Director Raul Agner and Resorts World Manila Director of Communication Martin Paz. Winning entries will have exhibit in Resorts World Manila, Pasay City on July 11-18. The grand winners of this year's National Paperclay Art Competition will be named on July 19 in the same venue. The grand champion will receive P100,000 cash prize while the second and third placer will bag home P75,000 and P50,000 respectively. JNBM Paperclay will also award the People’s Choice who will get P25,000 and the top 6 artworks will be given P10,000 each as consolation prize. Open to all Filipino citizens who are 18years old and above as of May 15, 2015. As proof of age and citizenship, all entrants must submit any government issued document or identification card (ID), photocopy of the artist’s birth certificate, passport, or any valid government ID showing birth date and citizenship when submitting their entries. Professional and non-professional artists are eligible to join the competition. Participation Fee: P500.00 inclusive of 5 big cups of Paperclay. Employees of JNBM, their affiliates, distributors, advertising and promotions agencies, companies involved in the production of the program materials and the implementation of the competition, their agents, as well as their respective relatives up to the 2nd degree of consanguinity and affinity are not eligible to participate in the competition. Medium: Paperclay and acrylic only on stretched boxed-type canvas. Weight: not more than 15 kilos. Should not be framed but have hanging provisions. for disqualification in the whole competition. The artworks must be ready for exhibition, and do not require assembly. Oil Paint and other paint aside from the Art Medium indicated on 4.2. JNBM said it reserves the right at its sole and absolute discretion, not to accept and/or disqualify any entry not meeting certain artistic and competition requirements or violating competition rules and regulations. All participants MUST USE the 2015 JNBM Registration Form when submitting their entries. Read all the mechanics, rules and regulations carefully. JNBM enforces strict implementation of set guidelines. Non-compliant entries on any of the stipulated rules will be disqualified. JNBM added that any participant or entry found to have violated the competition rules and regulations would be disqualified. The company reserves the right not to award any of the stipulated prizes should entries fail to meet the competition rules and standards. All decisions by the panel of judges are final. For more information of the JNBM Paperclay Art Competition, visit their official website or JNBM Facebook page.